John Sharman was full of praise for his Lancing Football Club squad as they made it a perfect Easter earlier today. Forwards Lewis Finney, Alex Fair and Liam Benson all struck, while substitute Lewis Broughton also netted to fire nine-man Lancers to a 4-1 Southern Combination League Premier Division win over Loxwood at Culver Road. Lancing, who were 4-0 victors against strugglers Hassocks on Saturday, had goalkeeper Tyler D’Cruz and striker Fair dismissed for dissent in the win over Magpies. Lancers were 3-0 up and in control at the break but Loxwood pulled one back soon after the restart and the home side had to see out the final 20 minutes with nine players. Remarkably, Lancing netted through substitute Broughton late on when down to nine players to take all three points. Lancers manager Sharman could not contain his delight after two wins from as many matches over Easter. He said: “I was so pleased with the performance and resilience we showed against Loxwood. “We were leading 3-0 at half-time and cruising. They (Loxwood) got one back, then we had both Tyler (D’Cruz) and Alex (Fair) sent off for dissent, with a long way still to go. Finney - who reached 100 Lancing goals in Saturday’s win at Hassocks - Fair and Benson all netted in the first 40 minutes to put the home side in complete control. Oliver Gill’s curling free-kick found the top corner to give Magpies hope on 70 minutes. Lancers goalkeeper D’Cruz was shown a straight red card for dissent in the aftermath. Substitute stopper Mark Stuart came on in place of George Rudwick following D’Cruz’s dismissal. 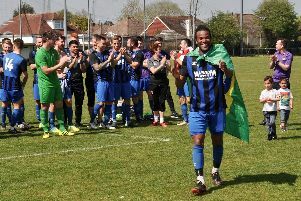 Frontman Fair was then given his marching orders ten minutes from time for dissent as Lancing were down to nine players. Lancers soaked up the pressure, scoring from a quick counter to make sure of the victory two minutes from time. Finney’s clever pass sent substitute Broughton clear and he wrapped things up. Prolific frontman Finney brought up 100 Lancing goals in the triumph over Hassocks two days prior to the win against Loxwood. Lancers boss Sharman hailed his now century goalscoring striker. LANCING v Loxwood: D’Cruz; Marsh, Bygraves, Sharman, Fenton; Rudwick, Williamson, Hendy; Finney, Fair, Benson. Subs: Stuart (Rudwick), Broughton (Benson), Adams, Tredrea, Watson.